Absolutely. 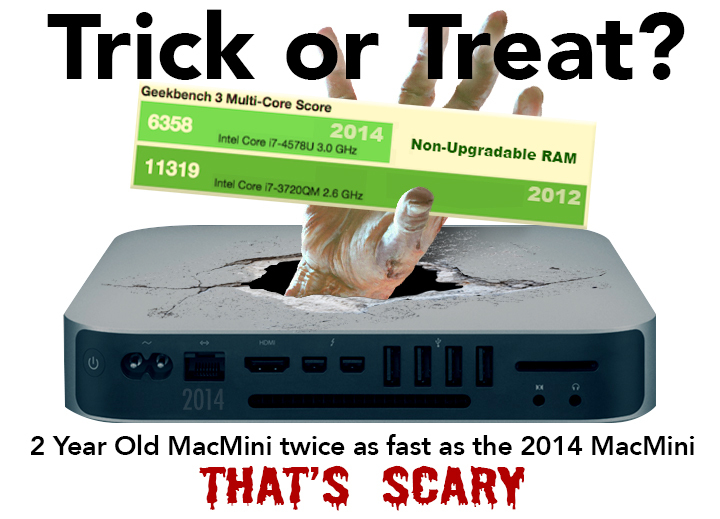 Someone buying a basic Mini to test the Mac experience will come away saying that the Mac is an underpowered toy. When you say to them that they need more RAM but can't add memory to their machine, they're going to hate it even more. How does this help in the fight to get PC users to switch? Yep. This is the crux of the problem. If adding DIMMs negatively affects system performance, why can you add memory to the higher end of the line, where performance is more crucial? Was anybody's Mini overheating because of DIMMs in the 2012 model? Limiting RAM expansion is purely a business decision for Apple. And I think it's a bad one. True. I'm not arguing that commercial users can't afford the RAM upgrade at purchase. I'm saying the decision to restrict upgrades to at-time-of-purchase limits the appeal of the computer for hobbyist uses, and makes the Mac solution more expensive to start with than PC alternatives. Even non-commercial users are affected. The selling point of the Mac used to be its creative potential. How many people can switch to Mac, start using iLife and iWork and not be affected by an artificial 4GB RAM limit in the first three years? What happens when they go to the App Store and discover that Pixelmator costs just 30 bucks? Everything will go Retina eventually. But I don't think the 21" will go Retina for at least 12-18 months. The whole point of the mini is the what you can do with it for the price. When Apple started selling intel Minis the first was was slow and not well received and they upped the speed and passive aggressively it feels like raised the price by $100. Then it became powerful enough to make money with it so Apple stopped updating them to see if people would get tired of waiting and buy an iMac. It was still popular so they made sure to take away the GPU on the affordable models and gave you the ability to have a real fast one at the price of an iMac. People still kept buying them so now they just raised the price of the $599 model by another $100 and made the cheap model as underpowered as a macbook air, which since its using chips that are years and years old now is not costing them much to produce. So now they want more money up front by not giving you enough ram that you must buy from them at time of purchase or never be able to upgrade again. Any used mini is better than these ones and the come at a lower price. Apple does feel the need to protect its iMac line against the Mini line. I think the reason for this historically was that they used to use economies of scale to procure the same screens for the iMac and Powerbook/MBP lines at lower cost. This stopped when the iMac went over the 15/17-inch mark. (Did the iMac share a screen with the 17" MacBook Pro? I can't remember.) If the Minis got too popular, it would negatively affect the cost of the mobile line as well. Naturally, this rationale went out the window many years back. Now I think the rationale is the same as the Auto industry: Sell small and profit small, but sell big and profit big. It's obviously more profitable to sell a computer with a screen and a limited shelf life than one that can be upgraded to last seven years. It makes a mockery of Apple's supposed environmental credentials, but nobody's supposed to mention that. I understand Apple's need to structure their line competitively. As I've mentioned, I have no problem with putting a lesser chip into the $499. offering, or restricting the base model to integrated graphics. This is appropriate to the target market. I just want to be able to add a stick of RAM if the need arises, or change the hard drive if it fails. To me, this is just basic computer maintenance. Would be nice to see them bring back high end Mac Pro work stations. I definitely don't agree with the decision on 4 GB for the base model. 4 GB was too low for Lion let alone Mountain Lion, Mavericks, and now Yosemite. 8 GB to me is the minimum and 16 GB is recommended. I can't even begin to express how disgusted I am with Apple over this Mac mini "upgrade". The mini was the only machine they made keeping me on the Mac platform, and now they've neutered it. Absolutely disgusting. Mind boggling disgusting. No, I'm not kidding. Sayonara. The performance of a 2012 machine in a late 2014 machine is a regression in my mind. I know I'm not Apple's prime target for this machine but it is the only machine that reasonably meets my needs for it. No iMac for me, don't need a new screen, keyboard or mouse. Mac Pro is far out of my needs. MB or MBA I do not need, I have one for work. I have an early 2009 Mac mini that I wanted to replace with this revision, but I will wait another 2 years. I will just slow down my adoption rate. This split exists because Apple is artificially building its strategy to get there. They heavily promote their mobile gear and the iMac, all other machines are requisites. To my mind you are wrongfully taking the result created by Apple's willful decisions as the reason why Apple had to take these decisions. The buying behavior form Apple's customers was created by Apple marketing heavily the mobiles and iMac and letting the other machines languish at a bad price/performance ratio. I got tired waiting for the Mini refresh. Boy, am I glad I did. Bought one of the 2012 models couple of months ago to record and serve up TV, music, video, etc., to the household. I required more RAM and a bigger HDD (installed a Fusion for speed). If I'd waited for this 2014 model I'd be stumped. It's a rip-off and, once again, Apple Board members and shareholders (except me and hopefully others) can scoff at people who love their integration but groan at the cynical hardware choices. I have a 2008 iMac with 4GB RAM. Runs Mavericks fine. No, I'm not kidding. Sayonara. I guess you were never really "locked in" to Apple, so it's easy to leave. I definitely want a new Mini to replace my one which is 4-5 years old now. Initially I was excited at being able to upgrade for only $499. But the lack of ram upgradability will be an issue. At least the HD size is usable. So then I looked at options for add ons. Obviously 8GB ram is a no brainer ($100 extra). But then I also looked at the CPU in the base model. Spec'd at 1.4 GHz. I noticed that the mid-range model has a faster processor, the ram I wanted and also a larger HD. All for only $200 more. So I think I now understand Apple's strategy. The base model is really the cheap of the cheap. It gets people interested and then for those who have no idea what the specs mean they will happily buy one. For those who have some experience they will realize that they need more ram and power and go for the next model up. Apple have always used this strategy but it can be annoying in times like this. Its a bummer about the upgradability of the newer machines but at this point my old mini is getting too long in the tooth and needs replacing. I had already spent ~$200 or increasing the drive space and memory but only a SSD will provide enough boost to keep it going and I am not willing to put more into it. So at the cost of $750 incl. taxes I will be able to get a new machine that lasts another 5 years or maybe longer this time. That is essentially what I paid the last time and if I remember correctly then I opted for the mid-range model then too. The real problem is that a new version is slower than a version brought to market two years ago, e. the quadcore one. That's inexcuseable. The most-expensive new version should have a quadcore i7. So anyone wishing to buy a new macmini and wanting to do more than surfing and office-work, like for example wanting to edit videos, transcode them... or other cpu-hungry tasks I strongly suggest to buy the 2012-quadcore-macminis instead. They are still available as new in lots of online shops, just not from Apple itself. I just ordered one with quadcore 2,3 GHz-i7-cpu. The additional upside will also be that I can circumvent the imho hideous looking new Yosemite-MacOSX for the next few years. Don't need the new features. And it still has a firewire port for my external firewire-HD. Source for such cheap ram, please? I paid $165 to go from 4GB to 16GB on my 2012 quad core I7 2.3ghz dual drive server model (the one just discontinued). It ran surprisingly poky under mavericks, now running quite fast under yosemite, i'd say at least 20% faster. so, who did you get that cheap 16GB from? Smartphones and tablet being mobile devices, it makes more sense to me that, eventually, they will be replacing laptops for many users. Not that laptop cannot replace desktop for many, but there's always an issue of screen's real estate - 24 - 27" is so much nicer than 13 - 15", where majority of laptops sit, regardless of platform. And then, one gets more upgrade-ability on desktop size, compared to laptops (on average) - an additional bonus. Also more performance for the money, easier maintenance and less heat related issues. Personally, I need/want laptop, but the only REAL reason for that is that I like fiddling with Lightroom and large RAM images when I travel, which requires proper laptop hardware and storage. Save for that, a SoC or Atom based tablet could do everything else I need away from home, and everything for coffee-table device as well. My current laptop is hardly being touched when I am at home. My tablet has to be recharged every day or two, meaning it gives at least 3 hours of actual use every day. And my desktop gets, I'd say, at least 10 hours of use during the week, though it has largest variations. With Broadwell parts entering tablet market, I believe I will face situation where slim tablet actually can, completely, replace laptop for me. At present, Surface 3 is almost there - almost, but not just yet.